A wide street by Cunningham Park and M.S. 74 in Windsor Park is slated for pedestrian safety improvements and a two-way protected bike lane alongside the park [PDF]. The Queens Community Board 11 transportation committee voted unanimously for the DOT plan last night. The two streets that form the eastern border of Cunningham Park — 210th Street and Oceania Street, which merge south of M.S. 74 — are wide and rife with speeding and double-parking. There were 25 traffic injuries on the two streets by the park between 2010 and 2014. To reduce speeding and improve bike access, the project calls for a two-way protected bike lane (with similar dimensions to the Prospect Park West bike lane) next to the park. 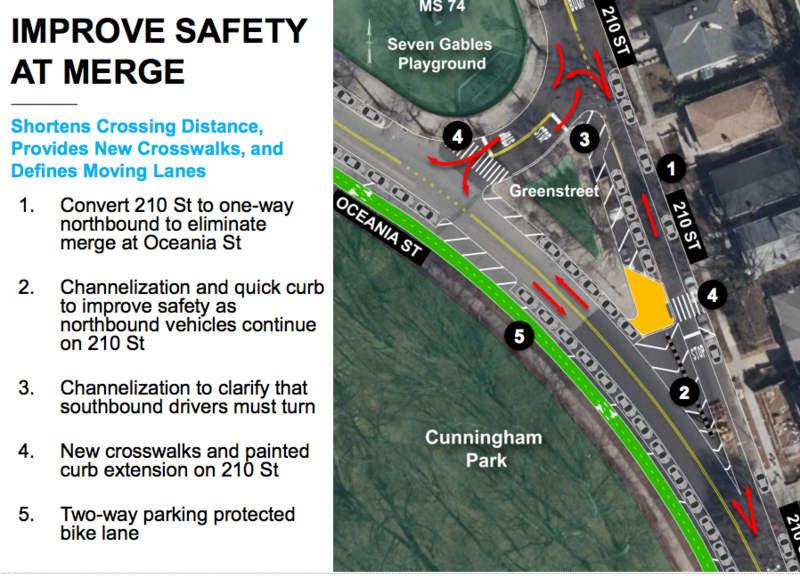 The protected bike lane will transition to buffered lanes on each side of the street where Oceania crosses over the Long Island Expressway. 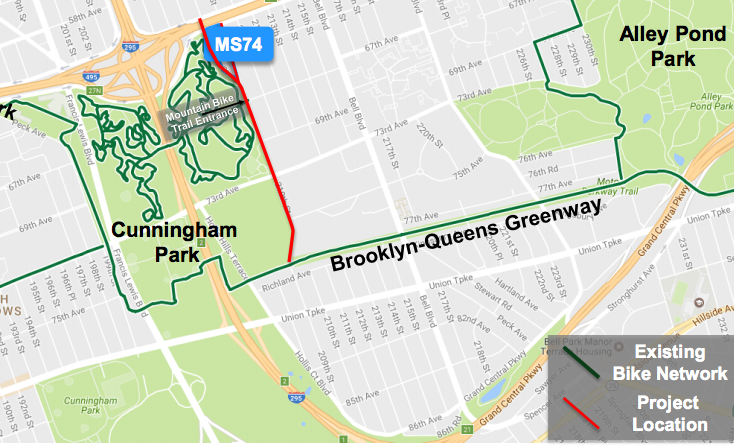 At the other end of the project, the bike lane will connect to the Vanderbilt Motor Parkway bike trail. In 2015, a head-on collision between two motorists killed a mother and daughter riding in the backseat of one vehicle and injured four other people. The crash happened right outside M.S. 74, and the project includes major safety improvements around the campus. Oceania Street and 210th Street, which surround the school, would both be designated school slow zones with 20 mph and 15 mph speed limits, respectively. DOT will also expand pedestrian space around the triangle where the two streets merge, adding crosswalks and stop signs. A small sliver of 210th Street will be converted to one-way northbound traffic flow to simplify what is currently a dangerous convergence of two two-way streets at an unusual angle. Two M.S. 74 administrators attended last night’s meeting to make a case for the project, according to John Kelly, who sits on the committee but is not a member of the full board. “Both of them said, ‘We need this done tomorrow, this is super-important for us,'” Kelly said. The transportation committee endorsed the proposal last night, though most members declined to express strong feelings one way or another, according to Kelly. He said it was not clear whether the plan would get a vote from the full board when it meets next Monday. any #sneckdown photos of the triangle ? suspect the pedestrian space could be expanded even more than designed, but this is a decent first phase. Check the DOT presentation – most of the traffic there is pickup/dropoff of kids by parents who choose to drive. So closing sounds doable – not sure it’s politically feasible given today’s climate. ya think in 5-7 years Moms will realize walking to school has benefits that outweigh any risks ? What is not mentioned and definitely needed near this school is a dedicated crossing signal for pedestrians crossing EB Horace Harding. Much of the traffic from SB Oceania St makes a left turn at the Horace Harding to get on the LIE ramp, making it a dangerous crosswalk for pedestrians, many of them school children. How about chopping another foot of the parking lanes so that the bikeway can be a decent width? Only eight feet isn’t quite enough for a bidirectional facility, especially near a park.